I wrote previously about my current task of fleshing out the local sandbox for my players and my difficulty with map scale. I'm still working on that. 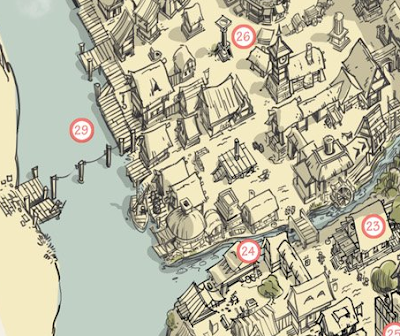 But in my daily rambling through the internets I ran across the D&D Doodle blog and something clicked in the way this map is drawn. Apparently this is the base town from the 4e Dungeon Masters Guide. The style is a teeny bit too cartoony for me, but then, that's part of its style, and what made me stop to look at it. It reminds me of a Disney style attraction map that I loved as a kid. On seeing the buildings presented isometrically, I knew that that's how I want to draw all my towns and cities if possible. 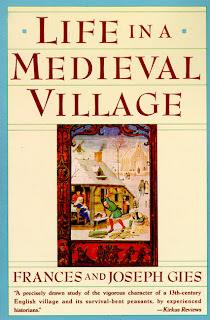 I've also been researching medieval villages and recommend Life in a Medieval Village by Frances and Joseph Gies. It gives enough meat for me to understand the dynamics at play in a village without getting dry and scholarly. I know now, for example, that villages will tend to cluster around 1) the manor house 2) the church 3) the road 4) all three. I also know the person living in the manor is not the lord but the man working for the lord, the reeve. Why does this matter? It doesn't. I'm sure you can whip out a map of a village in a few minutes that we could use as a adventure base and we'd have fun. But somehow, constitutionally, I want to know how things work underneath. Once I know the reasons and underpinnings, then I can make changes as I need. Part of it probably has to do with confidence, but part of it is probably related to curiosity-- I really do want to know what it was like living in a medieval village. 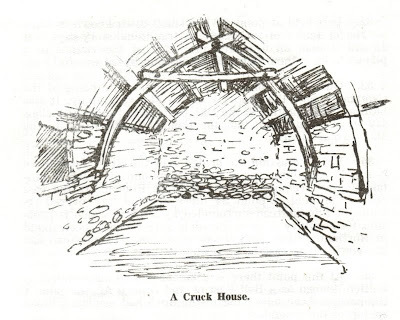 So, here I am reading about the construction of cruck-houses, in order to have a feel for the buildings that make up a village, in order to make a map of a village that my players may spend a night in. Haha. It's kind of sad. But it's interesting too, did you realize that people in Northern Europe had forgotten how to use rafters?! This was something the Romans knew. So the villagers regressed to these cruck-style roof supports (at least circa 1200-1300). Needless to say, all this research takes some time. But I'm hoping once I have it under my belt and feel comfortable with this knowledge, that I'll be able to, not only whip out maps of villages, but handle any questions players might have: "Oh, those peasants are carrying barley to the tithe barn," or "It's night, so the sheep are all in the lord's sheepfold" etc. So, combine the cool isometric map view and the realistic detail and you have what I want in a village map. I went hunting around the web and found this! This is so cool, exactly what I'd love to look at as a player in a campaign. I found this here. Which is apparently from a book by John Simkin. Unfortunately, I couldn't find the book for sale online. And it's only one image. So I pulled out some paper and pencil and I'm trying to emulate the style. But I'm not a trained artist. This is the kind of thing I'd love as a product. Give me five generic villages drawn in this way, with the briefest of keys just listing the types of buildings-- tithe barn, mill, tavern-- and I would pay good money for it. I suppose this it what the hobby is about: scratching our own itches, houseruling the way we want, designing our own dungeons etc. So I realize this might not interest you at all, but I would love a project that set as a goal to map and key a variety of historically realistic settings: a village, an abbey, a castle, a town. I know each of these have appeared in various levels of realism scattered through various modules and articles, but I think it would be cool to have the set together as a realistic baseline. Then if you wanted to add some fantastic elements or gonzify it you could. I stumbled across Midkemia Press' free download of Towns of the Outlands and I like it quite a bit. Its almost what would satisfy me. I love the different themes of the settlements: there's a mining town, a tribal fort, and a smuggler's cove, for example. But it has that generic D&D supplement feel to it, like somebody who knew no more than I do about mining technology in the 1300s plopped down and pulled something out of thin air. Well . . . I can do that. I suppose what I'm looking for is all the complexities and niggling details of expertise in the subject boiled down into a simple product I can use, knowing the expertise is behind it. I wonder if I'd been born in the UK or somewhere in Europe if I'd be this fascinated with these things. You have to keep in mind that where I'm from 100 years is oooooold. That in elementary school I studied Chumash indians, which was cool, but somehow grinding acorns between to stones doesn't capture my imagination like a castle under seige. Update 7/24/09: Added the link to the Yalding page. Thanks Chris for pointing it out. The site is worth poking around at. Here, for example is a map of Caerphilly Castle. Great post and cool idea for a resource. When I played Maelstrom it was the kind of thing we were looking for. Living in the UK, in Newcastle, by the remains of Hadrian's Wall, there was a day as a teenager when me and my friends stood in the small part of the castle that remains and it hit me - I live in the Keep on the Borderlands ! Hey, thanks. I'd never heard of Maelstrom. And on their website they had a free town in isometric style! Yeah, no Keeps out here, but I was lucky enough to experience the Giant Sequoias as a kid and they filled me with a sense of wonder. 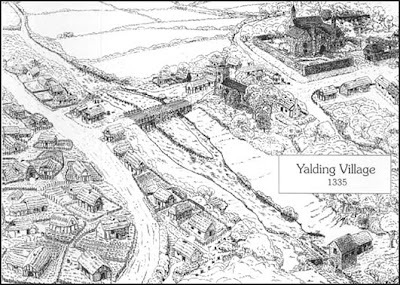 That Yalding village pic is from John Simkin's "A Medieval Village". Thanks Chris. Yep, that's where I got it, I should have said as much.